Just like silly putty, this awesome piece was made by pure accident! Funny story… We were having a bad time in the shop one day so we decided to take out our frustrations on a small pile of clay, and this happened! Just like silly putty, this awesome piece was made by pure accident! 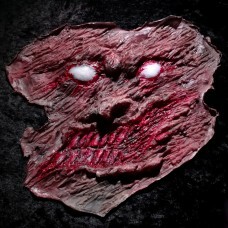 This guy looks great all gory and just grotesquely nailed/stapled to a bare spot on your wall, or thrown on a table, desk, in a frying pan, wherever you need to spice up the gore or gross factor, just toss this guy in! Not quite the face you want to see? Get a fresh latex pull & try your hand at painting it yourself!